Posted on April 16, 2018 by gayle. 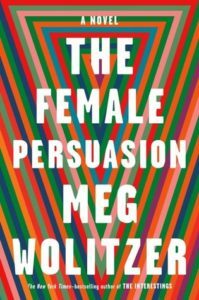 This entry was posted in Audiobooks, Fiction, Q&A and tagged Meg Wolitzer, the female persuasion. Bookmark the permalink. I totally agree about Female Persuasion being successful because the characters are compelling and I wanted to know how their lives were going to turn out. I feel like I wouldn’t have even considered it a #metoo era book if the publisher hadn’t marketed it that way. However, I loved it. And thanks for sharing the tidbits from her Q&A! This sounds like a good book club book – yes? I THINK so, but I am not sure there is a ton to talk about.